As our young members are preparing for exams it is time to spare a thought and prayer for them as they each plan for the future. With mock exams in the past and many modules completed life influencing decisions are being made. What University, to study what course? What subjects for ‘A’ level studies and for others choosing subjects for GCSE level studies. Each of these decisions is difficult and will result in different paths. We all hope our young members choose the most suitable path for each of them. Sometime ago BKY presented a 10-2-10 service based on Ecclesiastes 3.1 A time for everything. A message to each of them at time of hard work, concentration and worry is from Proverbs 24:14 Get wisdom and you have a bright future. I know all our young members are working hard. Our young members who are not immediately facing exams are making choices about which Secondary school to attend so hope all are content with places being recently confirmed. 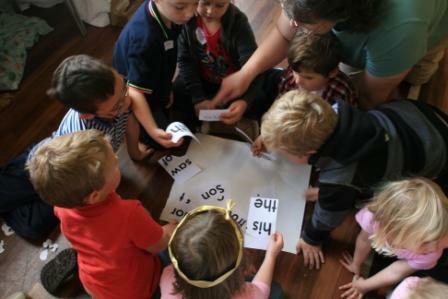 We have some young members who have been working hard in the puppeteers group to prepare worship. The contribution to services is always welcomed as they give a new light to worship. You never know our friend on in the picture may be available for regular pulpit supply. 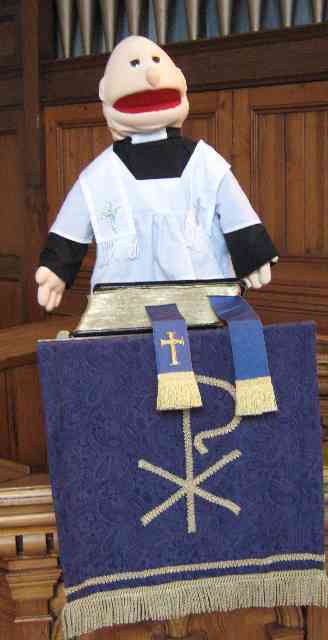 On occasions when the Minister is not available The Border Kirk can use the Puppet group to assist. The benefits are the replacement Ministers way with children and his shorter sermons. Although some members of the congregation have complained about the lack of snooze time between the Bible reading and next hymn. 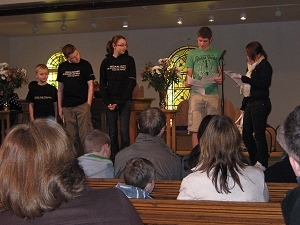 Citykidz at Aztec City centre churches in Carlisle arrange four events during the year and this was the first in 2012. The next event is on Good Friday and all children are welcome. Holiday Club last October was held in Longtown Community Centre and organised by the local churches. 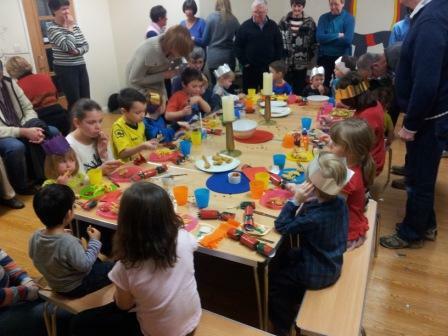 This has developed into Messy Church which is hosted once a month on Sunday afternoon. Date and time for this appears in the intimations. Our Young members, always willing to assist with the service. 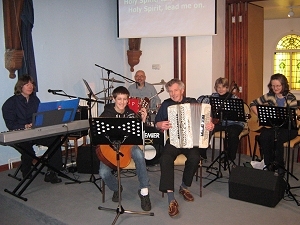 The Border Kirk Praise band always ready to learn a new song at short notice! the holy realm and worldly scene. Strengthen their faith in Provider God. Demonstrating that there are many ways for a MAN TO GIVE. No shock and awe, no fiery towers . . .
Help humanity learn HOW TO FORGIVE. Guide all daddies to be wise. Salvation reigns, there is no sin. For thine is the kingdom, the power, and the glory, forever, Amen.